EOP staff: Alexia Lozano, Forensic Science; EOP Interim Director Teresa de la Cruz; Sophie Peregrino, Biological Sciences; and Estephanie Hernandez, Sociology. Photo: David Schmitz. Erika Cortes’ shirt tells her story. On one side, it reads “I am EOP,” and on the other, “Born to Achieve Greatness.” As a high school student, she did not consider college a possibility until her field hockey coach encouraged her to look into an Educational Opportunity Program (EOP). Once at San Jose State, she took advantage of the program’s advising, tutoring and student support services, eventually working as a student assistant and EOP event coordinator. The first member of her family to graduate from college, Cortes wears her EOP shirt with pride. Before EOP was created 50 years ago, students like Cortes did not have the same resources to apply for, attend and stay in college. The federal program was designed to create opportunities for underrepresented, low-income and first-generation college students. EOP at San Jose State originated alongside the Olympic Project for Human Rights and the growing Chicano movement. The students and members of the staff and faculty who advocated for the creation of EOP did so to open the campus up to populations that historically had been prevented from attending. Many early EOP recruiters and volunteers partnered with local high schools to meet with students who did not meet university admissions requirements. Their goal? To break down institutional barriers to higher education and provide the services necessary to make college a reality for young people of color and first-generation college students. For five decades, San Jose State alumni and faculty and staff members have worked to recruit, prepare, retain and support students who otherwise might not have a clear pathway to a degree. Historically, San Jose State had a “two percent rule” for students who did not meet admission requirements—typically used to recruit student-athletes, especially young men of color. Simultaneous to the Chicano movement, Olympic Project for Human Rights founders Harry Edwards, ’64 Sociology, ’16 Honorary Doctorate, and Ken Noel, ’66 BA, ’68 MA, Sociology, organized efforts to demand that the university open the door for more African-American students with potential who were not athletes. When the program was initially created at San Jose State, Chicano and African-American student leaders lobbied the administration to open more slots for incoming students in both populations. This resulted in the university awarding campus funding for two separate programs: Chicano EOP and Black EOP. Tim Knowles, ’67 Secondary Education, was the first director of Black EOP, later handing the reins over to Glen Toney, ’71 MA Education, ’73 Mathematics. All Spartans themselves, the EOP directors wanted to create spaces where new students could find community and educational resources. By the time former student-athlete and professional football player S.T. Saffold was hired to be Toney’s assistant director in fall 1969, both EOP programs were beginning to grow. As a scholarship athlete, Saffold recognized that if EOP had existed when he was enrolled, he would have fit the profile of an EOP student. Saffold worked with Chicano EOP’s then director, Gabriel Reyes, ’72 Political Science, ’74 MA Mexican American Studies, to prepare underrepresented students for college and continue developing the services to keep them there. Since EOP was still a new idea, many universities struggled with how to best meet student needs. Would each ethnicity require its own EOP? A 1972 investigation by the Health, Education and Welfare department concluded that EOP could not be divided racially. Reyes and Saffold devised a structure to merge the programs. According to Reyes, early studies of student performance showed that those enrolled in EOP earned higher grade point averages than those of similar backgrounds who were not involved in the program. 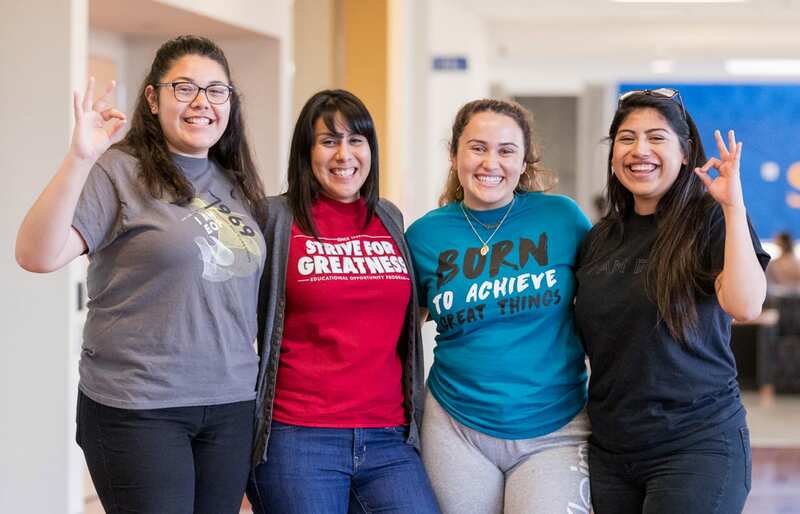 In addition to offering mentors, tutors and academic advisors to assist the students in navigating the complexity of a university system, EOP reinforced the message that its students were “college material”—leaders in the making. 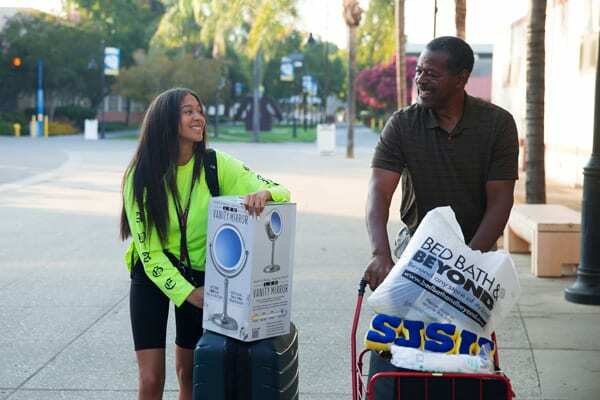 Saffold, ’67 Kinesiology, ’78 MA Education, moved his granddaughter Mikayla Saffold-Collins into the dorms in August 2018. Photo: David Schmitz. For Saffold, it was important—and remains important—that students see campus leaders who looked like them. Whenever he spotted a black student, staff member or professor, he’d acknowledge them because every acknowledgement sent a powerful message. To be acknowledged was to be seen; to be seen was to be recognized as a person worthy of attention, education and equal rights. As an undergraduate, he remembered seeing only three black faculty members on campus—and very rarely did he feel acknowledged by them. As an administrator and campus leader, he resolved to change that. 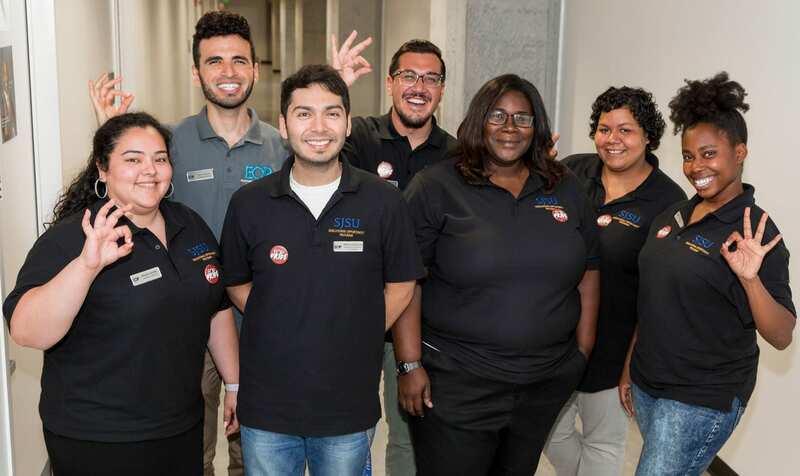 By identifying role models across campus, EOP offered students the chance to envision career pathways that they had never considered prior to coming to San Jose State. Robert Rigsby says that without EOP he would not have become a presidentially appointed judge of Washington D.C., making history as the first sitting judge from D.C. and the first military judge in the Army to deploy full time to an active theater of war. Rigsby is a frequent guest speaker in EOP’s I Can, I Will program, which provides guidance and support for African-American and Latino men. Despite evidence that EOP was making a measurable impact on students’ lives, throughout the 1990s and 2000s the program was vulnerable to changes in federal and state funding. This meant that EOP student services were severely limited or cut. It wasn’t until 2008, when San Jose State faculty and staff members established a task force to restore the program, identifying needs for new staff, space, an increased budget and an institutionalized EOP council, that the program began to revive. By the time Debra Griffith, ’04 MA Education, was appointed EOP director in 2010, she was determined to rebuild the program and establish a sustainable strategy for supporting and retaining students. Griffith strategized ways to create a space where students could connect with mentors, attend mandatory study skills workshops, meet with tutors and network with a community of peers. Throughout her eight years at the helm, EOP grew to 3,000 freshman and transfer students. Griffith has left EOP in the capable hands of her successor, Interim Director Teresa de la Cruz. She is confident that EOP is well-positioned to expand in the coming years. She need look no further than Cortes, who believes in improving access to higher education. As her shirt states, she was and will always remain EOP.